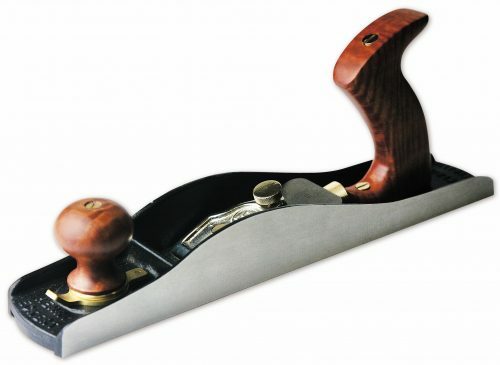 The Henry Eckert Low Angle jack Plane plane is based on the USA produced Stanley #62. We have used the best components available. The body is stressed relieved, locally cast, ductile iron and is precision surface ground flat giving accurate 90 degree sides. It weighs a hefty 2.6 kgs,(5.7 lbs) around the same as a ‘modern’ No.5 bevel down bench plane. It is the traditional length 350mm, and 64mm wide. The exceptional PMA11V tool steel blade is the thickest around for a No 62 (4.85mm), 50mm (2 inch) wide with a Howard Adjuster as standard. It sits on a precision machined 12 degree bed. The cap iron is hand cast white bronze. We manufactured the thumbscrews and fittings from solid brass. It has a precision machined adjustable mouth allowing the finest gossamer shaving or a thicker shaving for quick stock removal. Handles are offered in Fiddleback Red Gum or Huon Pine. The Red Gum comes from a massive tree in the north of South Australia. The timber from the tree is riddled with fiddleback but the lengths are short, just right for plane handles. Our Huon Pine choice (it is not a pine btw) is simply our homage to this famous timber indigenous to Australia, it’s Tasmanian history is incredible. Overtime the timber will turn a deep golden honey colour. The rear tote handle has enough height to ensure all four fingers sit comfortably. The handle and knob suits both small and large hands due to calculated thicknesses.. The weight is down low in the body, lowering the centre of gravity and increasing the heft and planing power of the tool. The side walls have more area to assist shooting board stability. A Hot Dog handle makes shooting board applications more comfortable. Craftsmen, carpenters & woodworkers determined the basic design elements of this tool mostly prior to the time Stanley manufactured the plane from 1905 – 1942. Today it is arguably the most versatile and effective hand plane available. Changing blade cutting angles or blade types makes it a smoother, a jointer for shorter workpieces, a shooting board plane, a tool for hogging out rough sawn timber, a scraper and more. The first 40 planes will be numbered with a certificate of authenticity.